We had the privilege of working with an undergrad in the Fall of 2011 who successfully went from an F (failing in interviews with BCG) to an offer with McKinsey. We played a small part in her story, squeezing in daily case prep interviews in the week before interviews to progressively improve her performance for each round, but we thought her entire process was worth sharing – you can see that she did most of the heavy lifting herself. I’m an international student who went to college (a target university) in the U.S. I had very little previous internship experience in business. Most of my experience during college was academic-related (e.g. research, etc.) – I majored in math and minored in engineering, so I had a good quant background, but not a lot of actual business experience at all. 2) What key steps did you take to get the interview invite – from your application to any networking you did? I applied during regular on-campus full-time recruitment. I submitted my resume and cover letter online — since my school was a target school, I didn’t do anything particularly special to make my application stand out. I was invited to interview with both BCG and McKinsey. 3) How did you pick your office preferences? Did that affect your recruiting process at all? I picked all offices based in the region I’m from (Southeast Asia) and ranked my home country first. Being from the region is strong (and self-explanatory) evidence that I can work/live in the environment, which is foreign to average Americans. It also meant that I wasn’t competing against all of my peers that were trying to work in New York or San Francisco – I think that made a big difference. 4) McKinsey is possibly the world’s most difficult firm to break into. Can you tell us the insider’s view of the interview process? After the PST, I was invited to an on-campus interview. The first-round cases strictly followed interviewer-led format. My interviewers were both relatively new at the firm (2nd year Business Analyst and Associate from NY office). While the first round was the same as U.S. recruiting, the second round was different for international offices. Similar to super days in banking interviews, all applicants to Asia offices flew to NY and interviewed with 3 partners/principals from Asia. Anything could happen in this round. One of my interviewers decided that the case he prepared was too difficult and came up with a new (strange) case on the fly. 4) How did you prepare for your interviews? What recommendations do you have for readers that have upcoming interviews with McKinsey? Be as detailed as possible. 1. Get used to basic business concepts and jargon. This is the most useful, particularly for applicants from a non-business degree background. Start doing the readings, anything from a Business for Dummies (don’t think it’s a real book) to Harvard Business Review would be useful. It’s hard to solve a case in a structured and creative way when you just get started. There are many books that outline popular frameworks in business. It’s fine to regurgitate frameworks at first. For me, it was rather crucial. Once those frameworks become rather intuitive, it was much easier for me to structure a more creative, personalized solution on top of my favorite framework than starting from scratch (think Newton). 3. Start solving cases on paper. Business cases, just as many things in life, are repetitive in nature. They say great leaders learn from the past; so, we should learn as much as we can from the available resources we can find. There are many casebooks available in bookstores and free online. The hardest part for me was the presentation. I got pretty comfortable solving cases on paper. But, when I started on live cases, all great ideas would vanish from my brain. Most of the credit should be given to Jenny Rae from Management Consulted who helped me get through it (from virtually an F in presentation to a decent passing score in a week). I was a horrible public speaker and couldn’t find the right words at the right times. She helped me structure and pace my presentation. At the same time, other than presentation, she also gave valuable feedback on the problem-solving parts. Within a few sessions, I became an OK candidate for a Business Analyst position. 5. Get your stories right. In every consulting interview I had, they asked me about my resume and leadership or teamwork experience. It is something everyone should be able to prepare – at least a few of them before the interview days. Again, Jenny Rae helped me pick the stories that fit with each theme and structure the stories nicely. 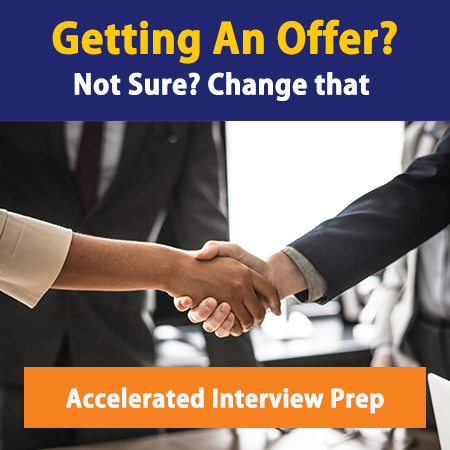 I think many people overlook this part in the preparation, while it is a key determining part of the interview – whether you are a good fit with their firm or not. Jenny is a very good story teller and I learned a lot from her. I crammed all of this into the few weeks before my interviews. I think it would have been much more effective if I had started much earlier. I’d suggest everyone start as soon as they know that they’d love to pursue a career in consulting. 5) What were some of your other choices, and why did you decide to join McKinsey? I got into a few top masters programs in the UK — I initially planned to go to grad school. I joined McKinsey mainly because it’s the place where I can learn and grow. Also, I love to analyze/come up with my own theories on random things in life and solve problems/puzzles and McKinsey seems to offer a place where I can do what I love and get paid for it. Consulting interviews are mostly about problem-solving skills and whether or not they’re comfortable with you on their teams. Your interviewers are most probably very smart and they know whether or not you really know how to do it. And, you can’t really pretend to be somebody you’re not once you get to work with them. So, get the problem-solving parts right and just be yourself. 7) What are you most excited about as you prepare for your start in consulting? What makes you the most nervous? Since I’m from a very quantitative background, I spoke a lot in numbers and charts. I’m most excited about the client/soft skills that I will learn from joining the team. It is also the same thing that makes me most nervous – I’m starting off with no experience in this realm.